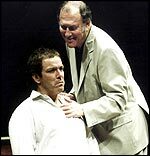 After the 1965 London premiere of The Homecoming, Anthony Seymour wrote in the Yorkshire Post that Harold Pinter “is more cruel, gruesome, and deliberately offensive in this two-act horror than in his previous plays. On its face value, it is callous and empty enough; what lies in the Freudian depths one dreads to think.” Lying there were more horrors in one or two acts, which Pinter has kept churning out with piddling artistic merit but to frantic Pavlovian acclaim. When Pinter, an accomplished actor, turned playwright, the thespians’ loss became the dramatists’ even greater one. Pinter the playwright proceeded to be not only horrible in himself but also the cause of horribleness in other playwrights, such as his sorcerer’s apprentice, David Mamet. Thus did Pinter manage to people the British Isles, and parts beyond, with more Calibans than Prospero’s gross and lecherous slave ever dreamt of. Every field, to be sure, has its spectacular phonies whose chief gift is self-promotion, but Pinter hogs several genres (including poetry, at which he is truly dreadful). Pinter has disported himself similarly on other such occasions since, but his key pronouncement came on that day: “I have no explanation for anything I do at all.” Yet even that flicker of seeming honesty is disingenuous. There are at least three explanations for what he does: arrogance, attitude, and charlatanism. So now we have at the Lincoln Center Festival 2001 a Pinter retrospective. It began with a double bill. A Kind of Alaska is a half-baked derivation from Oliver Sacks’s Awakenings chiefly notable for the fine performance of Penelope Wilton as a woman waking up at age 45 from a 29-year sleep, befuddled and incredulous. The companion piece in this Gate Theatre production, One for the Road, is about a torturer in a totalitarian state who plays beastly mind games with a mutilated prisoner, his repeatedly raped wife, and their doomed little son. Since torture of a not entirely dissimilar sort is his stock-in-trade, Pinter himself enacts the sadistic swine with flawless proficiency. The next bill was The Homecoming, with the original cast’s Ian Holm returning in a different role, making the event a Holmcoming. In this preposterous piece, a lower-class London family’s eldest son, who has become a professor of philosophy in the U.S., visits his creepy kinfolk with his mysterious wife. In the end, he goes back to America alone, leaving wifey to be the contented concubine of his father and brothers, whom she will also support as a prostitute in a posh pad provided by the pimp middle brother. The play is a perfect expression of Pinter’s misogyny, which flourished during his bohemian first marriage but abated during his current aristocratic one. This said, the Gate production is highly professional, although Holm impressed me more as Lenny the pimp than as Max the patriarch. Best in a good cast are Lia Williams, as the wife-mother turning whore, and Nick Dunning, as the loser husband. Miss Williams can load her silences with suggestion, make the slow movement of a leg ooze seductiveness, and utter monosyllables with a built-in echo effect that both electrifies and chills. Under Robin Lefevre’s canny direction, Dunning performs the usually passively played, victimized spouse with only intermittently repressed aggression, an ominous quietude that borders on, and sometimes overflows into, hostility. But nothing can salvage a play whose nastiness is further evidence, albeit unintended, of the banality of evil. Whether she knows it or not, Suzan-Lori Parks is a Pinter disciple. In a recent Times interview, she declared, “I’m less interested in meaning – whatever that word means, I’m not quite sure, I keep meaning to look up ‘meaning’ – than in doing.” Sure enough, her new play, Topdog/Underdog, is chock-full of doing, and perfectly devoid of meaning. Two black brothers, Lincoln and Booth, share a seedy furnished room. The topdog, Lincoln, in costume and whiteface, impersonates Honest Abe in a sideshow, for customers playing Booth to shoot at. His younger bro, underdog Booth, lives by shoplifting and practices three-card monte (which the author misspells), in the hope that older bro and he will resume this former activity and get rich. Two thirds of the play is about practicing and discussing the playing-card hustle; the rest is about Lincoln losing his job, Booth losing his girl, the amazing Grace, and about nastily comic power plays ending in absurd melodrama. It is beautifully played by Don Cheadle and Jeffrey Wright, and smartly staged by George C. Wolfe. If ever a production wagged the dog, Topdog/Underdog is it. But it is only fair that, after a Full Monty, we should get an empty one. In the aforementioned interview, Ms. Parks – who is 38, a Mount Holyoke graduate, and a professor of playwriting at Cal Arts – cites her recent discovery and study of Shakespeare: “That’s a writer I want to emulate. Great characters, great stories, great language. When you think of Shakespeare, you don’t think of meaning. You think of Richard II: ‘Let’s sit on the ground and sing Richard II, The Musical? sad stories of the death of kings.’ Whoa, here’s the king sitting on the ground! My heart’s breaking! That’s the kind of play I want to write.” Whoa! Find me the Shakespearean emulation in Topdog/Underdog or, failing that, any Shakespeare study unconcerned with meaning. Presented by Lincoln Center Festival 2001. By Suzan-Lori Parks; directed by George C. Wolfe; starring Jeffrey Wright and Don Cheadle.